This is all the clothing I brought with me to Panama, plus the clothes that I was wearing when I took this picture, (including my hiking boots). This was the first trip where I learned to wash my clothes in the sink every night and it worked marvelously. The temperature range for this trip was 40-90 degrees F and the entirety of my clothing packing was what’s on this bed and some Campsuds. I do wish that I would have brought a universal sink plug. I learned my lesson on this trip and started carrying one going forward. Update 2017: This amount of clothing is overkill. 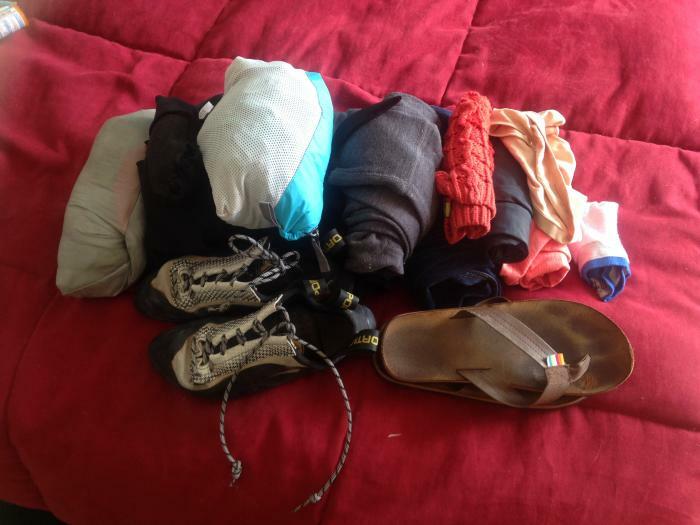 Check the post on packing for Cuba for a new and improved list. Also, I now bring my universal sink plug and a [amazon_textlink asin=’B00V7P1R86′ text=’steripen’ template=’ProductLink’ store=’80liters-20′ marketplace=’US’ link_id=’2764e573-dfc3-11e7-b2c6-bbbfc4aa37f4′] on every trip.